Manni - thanoscardgamess jimdo page! This is a suite of three plain trick taking games from Iceland. You may play Manni, Trjámann, and Hornafjarðarmanni. The games are for three players. Manni is a popular Icelandic card game and it means little man or chap, and is the name given to the spare hand of cards dealt to the table, which may be used to improve a player's hand. In Manni,12 cards are dealt to each player, in packets of four. 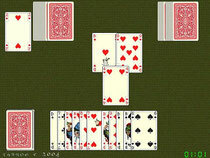 The remaining 12 cards form the Manni, which is placed face-down in the centre of the table and the player to dealer's left has the opportunity to change all 12 cards with the 12 cards of the Manni (whose cards are unknown). In Trjámann, 16 cards are dealt to each of the three players, an packets of four, and there are just four left for the Manni. Instead of the trump suit rotating, the player to dealer's left is the declarer, and must choose one of the four four possible contracts. In Hornafjarðarmanni, the twos are kept in the pack, and the deal is 4 cards to the spare cards, then 3 to each player, repeated until the spare cards are 16 cards and each player has 12. The player to dealer's right cuts the cards, and the cut card determines the contract.